Bolton, with its scenic view of the Humber River and historic buildings is one of Vaughan’s loveliest areas to visit. This spacious community lets residents and visitors have plenty of room to explore and experience all the city has to offer. Open space also means that driving is an essential part of staying in Bolton. Car detailing for our very necessary vehicles is an important part of having a safer, more enjoyable driving experiences. Because we love our community, Car Detailing Shop offers the best in environmentally friendly Bolton car detailing. We use only the safest products with natural ingredients with minimal chemicals along with water saving steam cleaning. By using the naturally antimicrobial properties of steam we’re able to reduce water usage and give you a superior, healthier clean that won’t put unnecessary chemicals into the water supply. This also makes the air inside your car better to breathe and won’t leave your vehicles swimming in unpleasant chemical fresheners and scents. 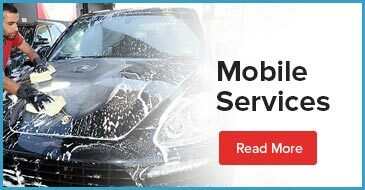 Car Detailing Shop Bolton car detailing technicians are all about giving your car the best, safest maintenance services possible. We equip our experts with everything they need for your interior and exterior detailing service. We bring along everything we need to get the job done from start to finish. Our 100% mobile service even includes electricity and water! This means we can service your car anywhere, anytime that is most convenient for you. Beginning our day in the early morning, the Bolton car detailing team can come to you before or after business hours or during a lunch break. For our industrial clients, this helps minimize interruption to regular business hours keeping your employees and customers on schedule. Car Detailing Shop has been serving the Bolton area with only the best mobile car care services since the start. We know how important vehicles are to our clients’ lives, work and businesses and we take great care in all we do for your vehicles. To find out why we have so many repeat customers, call Car Detailing Shop at 647-920-5199 to speak with a friendly, knowledgeable representative!